If you have been hearing an eerie buzz around your home lately, or you recently discovered a beehive of some sort, then it may be time to do some investigating to determine what type of bee you are dealing with. While many Jupiter or West Palm Beach pest control companies will generally tackle any bee-related job, it may not be necessary to call in the experts, depending on what needs to be done. These fluffy, furry bees are more often spotted on flowers in the garden or covering the ground where low lying flowers have recently bloomed. While they are generally pretty docile when on the hunt for nectar, these tiny creatures can become rather harsh if their nest is disturbed. Their homes are not going to be found hanging from a tree or in the eaves of your home. Bumble bees create much less formal structures in piles of leaves, grass clipping or small bushes. In some cases, they may even nest underground. Lawn care services will generally make recommendations for their removal should they be discovered. Constantly on the search for sticky, sweet substances, these are the bees that are likely to hover when you are enjoying a mid-summer treat. The upside down teardrop shape of their paper nest is generally very easily spotted and immediately recognizable. However, they may decide to build within a structure (even your home), in which case, a person would first notice the habit of the yellow jackets to come and go from one location. These entrance holes should not be sealed and it will be necessary to call in the professionals to address the problem. Known for a mean sting, these bees also build hanging paper nests and like to build them under deck railings, under house overhangs, or, in the worst cases, inside the attics of homes. When outdoors, there are a few DIY measures that can be taken for smaller nests, but problems within the home should be tackled by the experts. The hornet, is not one to mess with. These aggressive bees have been known to sting through clothing and will attack at the first sign of threat. They too build under deck railings and house overhangs, but they stay away from the interior of structures. They would rather build inside a shrub. You aren’t going to find a paper nest hanging with carpenter bees entering it. These strange creatures prefer wood and will drill perfect holes into your home with their mandibles. Much like termites, they are feared for their destructive nature, but carpenter bees generally tend to stay near the outer edges of a home, whereas termites will eat away at load bearing beams and anything else they can get to. Carpenter bees are less colonized than others, but still tend to nest near each other. 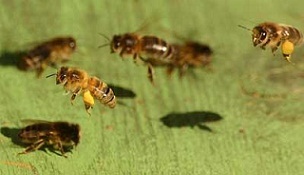 If you are having bee control problems in or around your home, contact Gulfstream Environmental Services today.